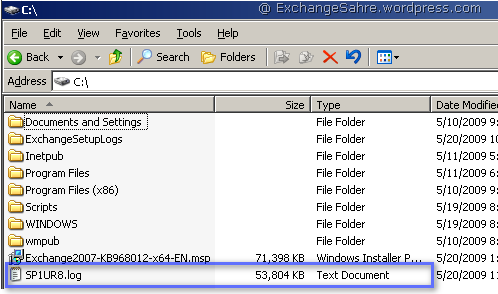 Exchange Update Rollup Installation. It is not Nightmare!!! Many people feel that installation of Exchange Update Rollup is a nightmare, does it really? Well, It doesn’t, if you take certain steps of prevention. Here are some of the myths which prevents from getting sleepless night for Update Rollups installation. Microsoft releases critical IUs for Exchange outside the Rollup schedule and can be obtained by contacting PSS. If you attempt to install the Rollup prior to removing the IU, you may get an error. Prevention Step: Any installed IUs must be removed prior to applying a Rollup. It is recommended to use the same account which was used to install Exchange server while installing Update Rollups. If you have to use different account then make sure that you have highest permission like Exchange Organization Admin and a member of Local Admin group of Exchange server. 3. Do you have CAS-CAS Proxying deployed? Apply the update rollup to the Internet-facing Client Access servers before you apply the update rollup to the non-Internet-facing Client Access servers. 4. Do you have Outlook Web Access customization? When you apply an update rollup package, the update process will copy over the OWA files if it is necessary. If you have modified the Logon.aspx file or other OWA files, the customizations will be overwritten to ensure that OWA is updated correctly. Prevention Step: Always make a backup copy of any customized Outlook Web Access files before you apply the update rollup. After you apply the update rollup package, re-create Outlook Web Access customization in Logon.aspx. Do you have IPv6 enabled in “Local Area Connection”? If you have IPv6 network and ticked/enabled in Local Area Connection, then it is fine. But if you do NOT have IPv6 network and somehow unticked/disabled in Local Area Connection, follow below steps before Update Rollup installation. Enable IPv6 in Local Area Connection. This may cause Exchange services to start or from changing ‘Startup Type’ (disabled to Automatic) after installation. 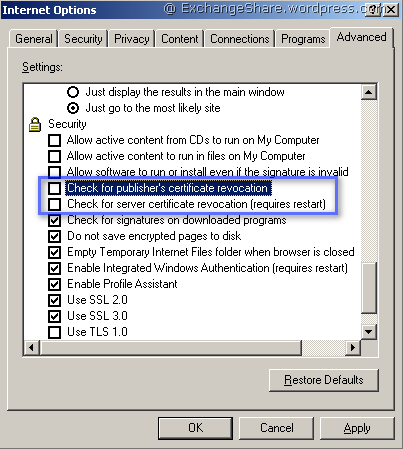 This issue occurs because the Exchange server issues network requests to connect to http://crl.microsoft.com/pki/crl/products/CodeSigPCA.crl and look up the certificate revocation list at NGEN time for each assembly that it compiles to native code. Because the Exchange server is not connected to the Internet, each request must wait to timeout before moving on. This problem occurs because you do not have a Microsoft .NET Framework common language runtime (CLR) build that supports the generatePublisherEvidence configuration setting. Run ExBPA regularly to find any misconfiguration, problems or standard recommendation from Microsoft on your Exchange environment. It is also recommended to run it before installation UR and correct the errors if shows in result. Now what if UR installation failed, where to start looking for the cause or reason behind failure? The Exchange Software Updates forum is available to get assistance if you come across with any update rollups installation issue. Microsoft engineers monitor the forum and assist you, but what they need to troubleshoot the issue? Information on your Exchange environment, how you are installing update rollup, and errors come up in various log files. These all things gives you and them hints to get resolution while troubleshooting. Here are some of the logs to start investigation. Look into Event Log for any error related to UR installation. Enable Verbose MSI Logging to generate setup log and look into it for any error. This is the starting place of forensic lab :), you may see some MSI related or any other errors which might have some numbers and with it setup would have failed. Product: Microsoft Exchange Server – Update ‘Update Rollup 8 for Exchange Server 2007 Service Pack 1 (KB968012) 8.1.375.2’ could not be installed. Error code 1603. Error code 1603 is pretty generic in MSI installation and to look further deep we need to enable verbose MSI logging. Question comes, how? Ok, let’s discuss it in next portion. Let’s take an example of Exchange 2007 SP1 UR8 which was released sometimes back. I am executing it with below command. This will generate extensive log of UR installation and log an activity of each and every step. You can open this log and check for errors which may shed some light on why the installation failure occurred. If you create a thread at Exchange Software Updates forum or log a call with Microsoft PSS, they will ask for this file anyway. This file keeps the log of service ‘Status’ and ‘Startup Type’ changes happened by ServiceControl.ps1 script during UR installation. We may find the cause of service, if stopped or disabled during UR installation. 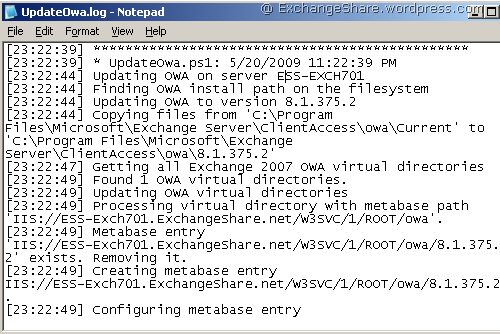 This file keeps the log of OWA changes performed by UpdateOWA.ps1 during UR installation. Here is an example of UpdateOwa.log file generated during successful UR8 installation but we may find the cause here if OWA comes up with errors after UR installation. We can also find UpdateOWA.PS1 script under Program Files\Microsoft\Exchange Server\Bin directory which can be run to correct OWA errors came after UR installation. Thanks for the good overview. One of the steps that is not discribe is that when we have Forefront for Exchange that we disable Forefront with the command line tool before we install any Updates to Exchange..
Is there a proper order to install rollups? For example, we have a server that has rollup 5 missing…should we install rollup 5? It has all the others installed…do I need to back down from the top to rollup 5 and then reinstall after?